The quaint beachside town of Bucerias just north of Villa La Estancia in Nuevo Vallarta is home to a fabulous art walk every Thursday evening during high season between the hours of 7pm to 9pm. 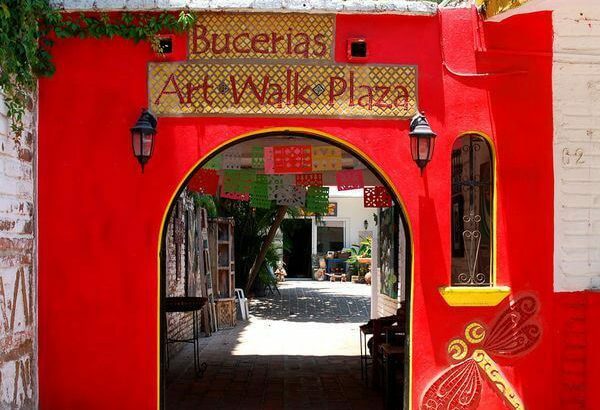 The Bucerias Art Walk is a wonderful way to spend an evening strolling the quaint streets of Bucerias while enjoying incredible art, delightful sea breezes, and much more. Continue reading below to see why Villa La Estancia homeowners should spend their next Thursday strolling the streets during Bucerias Art Walk. Bucerias is a wonderful small town that is especially popular with expats who have decided to make their home in the area. For Villa La Estancia homeowners, Bucerias is just a short 10 minute drive away from home. The Bucerias Art walk will include plenty of quality art, crafts, jewellery and handcrafted furniture. There are 14 art galleries that are in close proximity to one another which makes it ideal for an evening stroll with family or friends. Be ready to enjoy a wide array of Mexican arts and crafts including textiles, paintings, glassware, furniture, jewellery, portrait, mosaics and so much more. Curious which galleries you shouldn’t miss? Top art galleries to visit include Milagros, Splash of Glass, Casabor – Galeria Mexicana, Jan Marie Boutique, Sandrina’s and the Casa del Artesano. A bit off the beaten path, make sure to head south to explore the recently opened Hacienda de Arte. A beautiful open air hacienda with contemporary and abstract pieces from local artists, Hacienda de Arte also regularly hosts interesting workshops, yoga classes, kids kung fu classes, painting classes and so much more. Top tip: A local astrology expert at Hacienda del Arte that has earned rave reviews will offer personalized tarot card readings for just 180 pesos. Do you dare to see what’s in the cards for you? In addition to the incredible art galleries, the evening ambiance at Bucerias Art Walk is vibrant and lively with a great mix of locals and visitors. Want to enjoy dinner as well? There are a ton of great dining options in the area if you would like to enjoy dinner or drinks as well. La Postal, Mark’s, La Negra and Sandrina’s are a few good spots to try. Or skip dinner and take more time to enjoy the beautiful art as many art galleries offer complimentary wine and appetizers. Sip a glass of wine and nibble away as you peruse the latest and greatest art for sale. Live music in the street will delight you as local musicians will be in attendance throughout the evening. Have a special request? They will perform on the spot for you for a small fee. Bucerias Art walk is the place to be on Thursday evenings in Bucerias. Tourists, locals and artists all come together to enjoy the exciting ambiance and the pleasant ocean breezes. Do you live in Villa La Estancia in Nuevo Vallarta? You are in luck! Make sure to visit Bucerias Art Walk on Thursday evening from 7pm to 9pm. Stroll the charming streets of this quaint beachside town as you enjoy a fun filled evening of art, culture and music. Recommended for you: Why Live in Nuevo Vallarta?